Jennifer Fielder is a member of the Montana State Senate. She has held that office since 2012. Fielder is also the CEO of the American Lands Council, an organization that advocates for the transfer of federal public lands to states. She supported the Trump administration’s national monument review and opposed funding the Land and Water Conservation Fund (LWCF). She voted against a bipartisan bill to implement Obama-era sage grouse conservation plans. Fielder sponsored a variety of anti-public lands bills in 2017. Jennifer Fielder praised Donald Trump’s review of national monuments. Jennifer Fielder opposes funding for the Land and Water Conservation Fund (LWCF). Jennifer Fielder is the CEO of an organization that advocates for the transfer of federal public lands to states. 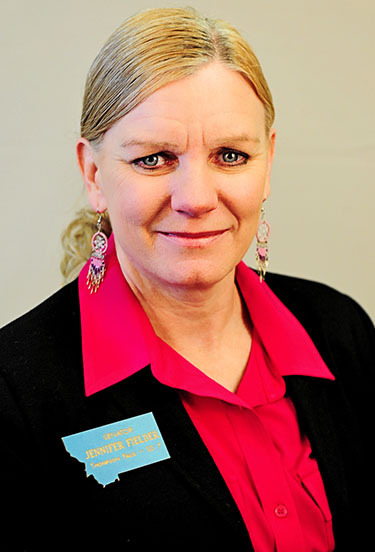 Jennifer Fielder voted against a bill to implement Governor Bullock’s sage grouse management plan in 2015. Jennifer Fielder sponsored a variety of anti-public lands bills in 2017.